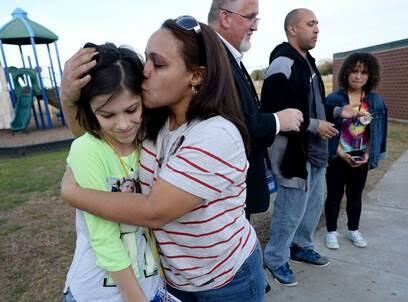 NOLANVILLE — During a brief ceremony filled with smiles and tears, about 30 friends and family members gathered at Cavazos Elementary School on Wednesday afternoon to dedicate a playground bench in honor of a boy who lost his life in a drowning incident earlier this year. The idea for the bench, dedicated to the memory of 11-year-old Matthew Natal, was conceived by Johnily Considine, a close friend of Matthew’s. Principal Joe Gullekson thanked those in attendance and credited Johnily with wanting to do something nice for Matthew that was also useful, noting that blue was Matthew’s favorite color. Gullekson said Matthew was active and loved the outdoors. “A place to sit and watch kids play is appropriate for him,” he said. Rebecca Natal, Matthew’s mother, thanked the community for its support over the months since her son’s drowning. Following the ceremony, families and friends released blue balloons into the late-afternoon sky. On what would have been Matthew Natal’s 12th birthday today, his family is calling for action from the city of Nolanville. Matthew died June 18 after becoming trapped for at least 10 minutes the day before inside a flash-flooded drainage culvert on 10th Street, near the J.W. Sims Community Center in Nolanville. Matthew’s parents are asking city representatives to take immediate action to prevent further deaths caused by Texas flash floods, representatives of the Josh Davis Law [Group], which has offices in Houston and San Antonio, stated in a news release. “Since the incident, Matthew’s parents have postponed filing suit so that the City of Nolanville can use their funds purposefully and fix the detention pond, thereby saving the lives of future children in the Nolanville community,” the release states. Representatives allege no action has been taken by the city since Matthew’s death and that the area did not contain a fence, wall, barrier or warning signs to prevent access. During the public comments portion of a Sept. 3 council meeting, resident Ed Mitchell said he was concerned because of the same reasons. “There’s no fence to keep toddlers out, and there’s no cage to keep people from getting sucked in,” Mitchell previously told council members. “I’d like you to do something.” City Manager Kara Escajeda said city representatives are supposed to meet with the Natal family today. She directed specific questions regarding the matter to the city’s attorney. During a memorial to celebrate Matthew’s life on June 19, family members thanked Nolanville police, Central Bell County Fire and Rescue personnel and other community members who responded to the accident. Matthew’s father, Melvin Natal, also thanked resident DeAngelo Crowder, who tried to hold the boy above water before first responders arrived to pull him from the culvert amid flash flooding in the area. “He gave me an extra 24 hours to talk to him and say my goodbyes,” Natal previously said.